I have been waiting for this book since I first discovered LA Casey and read Dominic. LA takes a beautifully dysfunctional family and makes you fall in love, drool and swoon all at the same time. 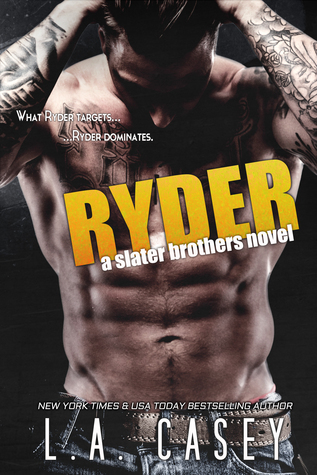 The Slater Brothers are all crass and macho Alphas until the women are around and show them who's boss. Branna is the glue that holds everyone together, but what happens when she needs help? Ryder is always on his phone and always disappearing. They never talk anymore unless it's yelling and Branna has had enough. Can they work things out? I was riveted to my seat while reading this. I laughed, cried and screamed at my ereader. This story will have you on the edge of your seat and pull at your heartstrings. It goes without saying that your ereader will catch fire too, as there's a Slater involved. This is a series that is a must read and I recommend it to everyone looking for their next great read.